Activated magnetic beads for coupling of amino containing ligands. LOABeads AffiActive are surface activated magnetic agarose beads employing Lab on a Bead’s patented coupling chemistry. Any ligand containing amino groups or thiols, e.g. proteins and peptides can be covalently bound to the beads using a simple process. All steps are performed at physiological conditions and room temperature, without using any hazardous reagents or organic solvents. After coupling of the ligand, the magnetic beads can be used for affinity purification and immunoprecipitation. The coupling capacity of LOABeads AffiActive is 5–10 mg protein per ml settled beads, e.g., 5–7.5 mg protein A per ml settled beads or up to 10 mg IgG per ml settled beads. The bond is very stable (6 ppm leakage of protein A) and the beads can be stored with bound ligand. 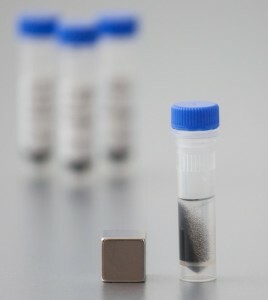 The black beads are clearly visible and easily attracted to external magnets, enabling distinct separation within seconds, which leads to minimal sample loss. 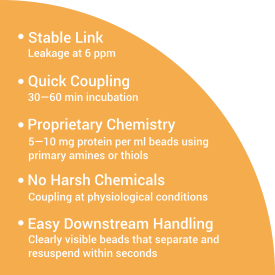 The 4% agarose matrix offers minimal unspecific binding and makes the beads non-adherent, letting the beads be easily dispersed and resuspended. The purification setup can easily be scaled up or down to match antibody concentration and sample volumes. LOABeads AffiActive work excellently for separations from microliter to liter scales using suitable magnetic separators, such as the LOABeads MagSep series. LOABeads AffiActive supplied as a 10% bead suspension in PBS with 20% ethanol. * 90% coupling of rabbit IgG (1 mg/ml) after 60 min incubation. ** Data of product stability is continuously updated based on ongoing stability studies.